Growing up, Wade Fetzer '61 watched his father give back to the community through volunteer service to a number of organizations. So when a family friend tapped Fetzer himself for the junior board of Chicago's Metropolitan Family Services just a few years after his Kellogg School graduation, Fetzer leaped at the chance, even though he knew little about the organization's mission. "At the time I didn't really know what family services or social work was," reflects Fetzer, a retired partner with Goldman Sachs. "But I quickly became impressed and excited with the work they were doing." The work included counseling and support services to assist some 55,000 individuals and families through difficult times each year. Fast-forward 40 years. Fetzer now converses in the language of social work, cataloguing some of the problems that face clients of the 150-year-old nonprofit organization — juvenile delinquency, school truancy and teen pregnancy to name a few. He remembers his efforts on Metropolitan Family Service's social advocacy committee, including a memorable trip to Springfield, Ill., in which he testified before state legislators on the necessity of a welfare increase. "That was very interesting for me as a conservative Republican," he reflects, "but I believe in trying to solve things at the local level." 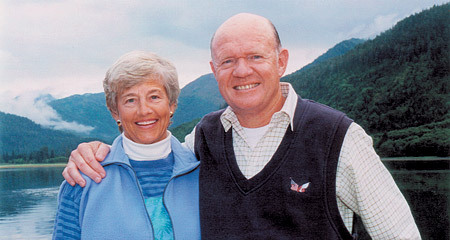 And in December, Fetzer and his family — wife Bev and daughters Linda Fetzer and Laurie Shults, who have also served the organization over the years — were honored with Metropolitan Family Services' inaugural "Family of the Year Award" for an outstanding record of more than four decades of service. "I grew up with community service as one of my main charters. I'm not the kind of person to put in my three years and leave," Fetzer says, laughing. Fetzer's importance to the nonprofit organization grew in tandem with a successful career as a banker in the Chicago office of Goldman Sachs, where he began his career in 1971. One of his proudest accomplishments: building and strengthening the firm's Midwest region as its manager. He became general partner in 1986. But the 1961 graduate's community service record doesn't end there. He has contributed to his undergraduate alma mater, University of Wisconsin-Madison, including by serving on the UW Foundation Board of Directors and advancing minority recruitment and retention at the school. He has also cultivated an enduring and important relationship with the Kellogg School. Many, including Dean Emeritus Donald P. Jacobs, credit him with building the school's Alumni Advisory Board. Jacobs asked Fetzer to chair the board, something the alum did for 12 years. Says Jacobs: "Wade Fetzer is a wonderful person — warmhearted and giving of his time and activities. More than that, he has been a tower of strength in developing the Kellogg alumni network." Add to that praise the voice of Liz Livingston Howard, associate director of the school's Center for Nonprofit Management and Social Enterprise at Kellogg Program (SEEK), who says: "Wade Fetzer has been a driving force for success at Kellogg. As leader of the Kellogg Alumni Advisory Board, Wade was dedicated to creating opportunities to engage the board's creative talents and to encourage their support of the school. His commitment and enthusiasm was contagious and he continually brought out the best in volunteers and staff." For Fetzer, retirement holds an added bonus: more time to assist the nonprofit organizations that were such a priority during his working life. "As Kellogg alums, we're united by the belief that we've been lucky. It's important to take opportunities to give back," he says.